Ancient stands of redwood trees loom majestically, lords of the forest. Clinging to great swaths of land along California’s northern coast, they foster an astonishing density of life – birds, animals, mosses, shrubs, and wildflowers. On entering the forest, you feel exhilarated and at the same time very small. Once you have been to the Redwoods, you never lose that humble feeling. Beneath one giant tree, long dangling branches whickered softly as I set my tent. Low evening sun threw dappled light that played on moss-covered picnic tables, tree duff, railings, sign-posts. Everything at ground level was covered in bits of tree debris or damp with the moist atmosphere. 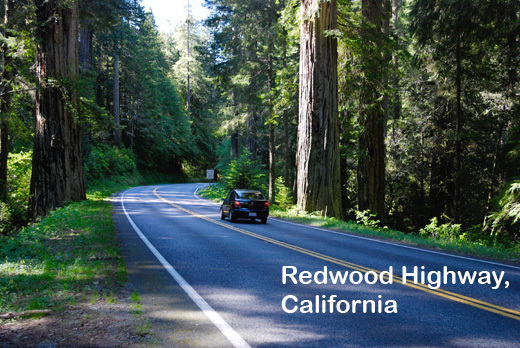 Out of the rains of Seattle, I had driven through sun-drenched Oregon to take the Redwood Highway south. Del Norte Coastal Redwoods State Park was an ideal stopping point for the night, as far as I could make it in a long day’s drive. 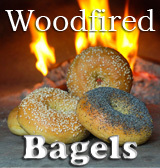 And it put me within range of my fellow woodfired fanatic Bill down in Arcata. So what’s not to love about camping in the Redwoods? I was self-contained, with tent, sleeping bag, Coleman stove, a few pots and pans, and enough food for a small army stashed in the cooler and in the nooks and crannies of my car’s trunk. It felt so good to be out in the woods that I even came to overlook the steep price that California’s state parks were charging for camping. It was all part of paying down the state deficit, I decided. Now just because you’re camping, that doesn’t mean you can’t eat well. 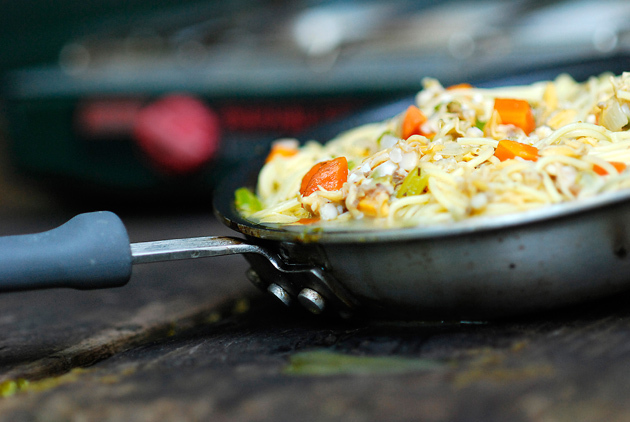 With a small amount of forward thinking, you can bring along all of the ingredients for one of my favorite camping dinners: Clam Spaghetti, with garlic, carrot, celery and onion sautéed in olive oil. So good, and so easy to make, even on a Coleman stove. Here’s how to do it. Cook the pasta: When boiling water on a Coleman stove, use the burner closest to the gas supply for best results, and make sure all fittings are turned tightly. In a small pot with a tightly fitted lid, bring one quart of water to a boil over highest heat. When the water is boiling, add the pasta and, stirring every minute or two, cook the pasta for 1 minute less than package directions. Sauté the veggies: Chop the veggies. When camping, we carry a small cutting board, but friends swear by the roll-up plastic cutting boards. 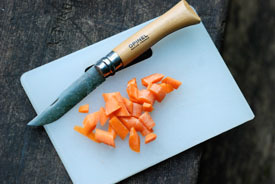 For a knife, we use a folding Opinel knife, which is ideal. Put the oil into an 8” frying pan and bring to medium heat, about 2 minutes. Add the veggies and sauté for 5-7 minutes, until they soften in color and texture but are still crunchy. Sprinkle on the thyme and toss to distribute. Finish the dish: When noodles are nearly cooked, drain the water from them. Add the noodles, the clams and the clam broth to the veggies and sauté together for a further 3 or 4 minutes until heated thoroughly. Divide into two and serve piping hot with crusty bread for dipping. Note: This recipe is based on cooking for two people, so you need only a small pot for water and an 8” frying pan. If you’re cooking for a larger crowd, you will need larger pots and pans or more than one Coleman stove. In the case of larger pots and pans, it will take considerably more time to boil water, so be forewarned. At higher altitudes the time becomes even longer. In the morning, I penetrated the thick brush of the Charles W. and Mamie A. Knights Memorial Grove, to stand in awe as the sunshine revived the forest. With a half dozen centuries old trees holding court around me, my senses were on overload and my neck hurt from looking up. With regret, I walked away from those magnificent trees. yeahh camping! Aren’t the redwoods amazing? Love that you chose clams for camping food! Don, Great pics, great story and great food. Thanks for the mention and the excellent visit. Love the truffle cheese. What a great idea – I’ve never attempted more than hot dogs while camping! I’m getting soooo excited for our Hwy 1/101 road trip next summer (Seattle to LA). Maybe I’ll get brave and follow your lead… One thing we will definitely be doing (speaking of Arcata) is stopping for breakfast at the Samoa Cookhouse. For our family, a Pacific Coast road trip just isn’t complete without it. Did you stop there by chance? 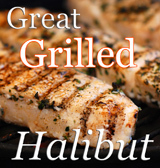 Not this time, but I took my family to the Samoan Cookhouse for a memorable dinner about 10 years ago. If I remember correctly, the fare was pork chops. They came to the table heaped high on platters, along with great bowls of vegetables, mounds of mashed potatoes and baskets of dinner rolls. My kids’ eyes got so big and bulging trying to take it all in that we had to tell them to stop staring and start eating… Man, those woodcutters knew how to eat! The spaghetti looks delicious and I can’t wait to visit the Redwoods myself some weekend soon. I think I’ll put something like this together for my July camping trip up at Larrabee state park. I’ll be cooking for a crowd and this looks like it’d be delicious and really not too hard to make in quantity. I just went camping last weekend! Love it! We went to Happy Jack, Arizona. I am planning a trip to the South rim of the Grand Canyon next month and was told that I need to cook… I’m thinking clam spaghetti sounds good to me. Thanks for sharing!! Love your post, the redwoods and the Opinel! What a great meal for a camping trip. The redwoods sounds amazing. We are in the process of planning our annual camping trip. Can’t wait! Hahah, that little furry guy climbing in your coleman is too funny! And I completely agree with your sentiment about the Redwoods, they are awe-inspiring. Did the sous chef help? I love the redwoods and need to get back out their soon. This is some camping dinner! It sounds like a lot of fun and looks great. Last time I visited your blog you were cooking in the snow! I wish I was out in some big old woods, bet it’s cool out there. Anyway, I love the clam spaghetti – but what is that in your saucepan? Was it alive? This almost makes me want to go camping! Oh how I miss the Redwoods! this looks like a delightful meal in a wonderful surrounding. thank you for sharing! Ahahah spaghetti clams while camping! I am amazed and quite impressed! last time I camped I ate chips and BBQ, that is definitely gourmet camping. You must be close to me then since you are in the middle of the redwoods! so beautiful! Bravo! quite an exploit! It is great you were able to cook like that camping. I would just stick to hot dogs and hamburgers. It looks great. This is great! 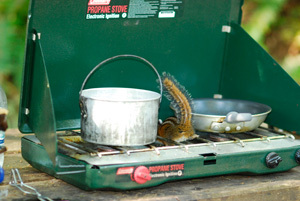 We always struggle finding things to cook that aren’t too fussy while camping. I’ll have to save this one for the next camping trip. By the way…just realized you have an earth oven! I built one in our backyard last summer and absolutely love it! The oven’s dry radiant heat is unmatched by the puny household oven. I love knowing someone else with a great outdoor oven. So, I am not a camper, but you might convert me with a pasta dish like this! My idea of camping is the holiday inn. BTW, it is certainly beautiful there. Very adventurous! We usually just make the hobo foil packs that you throw in the fire! I’m definitely going to have to rethink my camping strategies! Sounds like a great snack. I’m almost certain that I’ve tried a spaghetti with clams before. Either way … sounds good. I like to cook a hot meal when I camp at Prairie Creek redwoods, and take it in my truck up to the parkway. Then I put a chair in the bed of the truck and sit and eat, watching the elk in the prairie as dark starts to set-in. Holy moley! That picture (not the chipmunk, as I’ve never seen one here) looks just like Cathedral Grove, between Parksville and Port Alberni, on Vancouver Island! It’s a Provincial Park, so we are not allowed to camp there, but it is truly beautiful too. I used to like to bring all the fixings for meals like this too, but over the years, have decided to do all the veggie cutting at home and bringing them along in the cooler in zip-loc baggies. I’ve even pre-cooked the pasta at home too, though I like it to be done less than al dente, so that it is just right by the time it’s reheated with the other ingredients. Guess I’ve gotten lazy in my old age lol.